Pull the emails and contact information of insurance agents and brokers easily when you download our verified, reliable database. Better focus your marketing efforts and enhance your B2B strategies with the help of our ready-to-download insurance agent email list! This extensive insurance list of sales leads includes individuals with "insurance agent" or "insurance broker" listed as their job titles. This means that you can email leads and directly contact the people with decision-making power within the world of insurance. 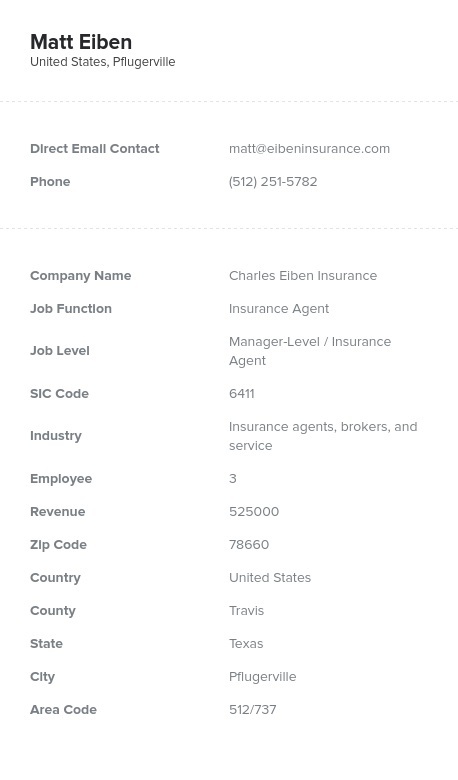 With this accurate, sales-generating data product, you can find and connect with your specific target audience: insurance agents and brokers. This insurance agent mailing list is pre-built; you can buy and download it right now to find the emails, phone numbers, fax numbers, addresses, titles, and names. Easily integrate it into your greater marketing strategy and start contacting agents and brokers within minutes. Our data is human-verified, not just automated, and very affordable, resulting in the best cost/quality ratio in the industry. Bookyourdata.com can help you connect with insurance agents and brokers whether you plan to market your software, offer your services, network with a community of agents, or let them know about a new organizational product. An accurate list can help your business make sales, foster new relationships, and experience growth. Our list of insurance agents and brokers can help your business reach out. Download this complete insurance agent email database now, or customize your list so that it meets all of your marketing needs today.